The role and the meaning of hunting in the mountains are not without ambiguities. The relation between domesticated and wild life, the symbolic dimension and the social implications raise questions and occasionally move the lines between preconceived ideas. The topic is complex enough to induce us all to think again. What were they looking for at the foot of the glaciers, those stone-age adventurers ? Marmots, eagles, ibexes and cave bears represented new resources as well as new experiences. Far from being a simple « war among beasts », prehistoric hunting opened up the Alpine spaces to human imagination. The wild hunt is a story told around the world. Its Alpine versions are as numerous and varied as the others. The passage of the savage group is synonymous with punishment, fury and fear, but also eroticism and fertility. Gaston Fébus, Count of Foix, wrote his Livre de chasse, a magnificently illustrated manuscript, at the end of the 1300s. He was a passionate hunter and wonderful story teller. The book is a brilliant presentation of his long experience in hunting techniques, vast knowledge of wild animals and intense love of the Pyrenees. Truly a unique book to be savoured. The Hunting and Nature Museum in Paris was recently renovated. It contains remarkable cultural and artistic treasures portraying the relations between humans and wild animals. Notably a collection of some 300 magnificently decorated power horns. 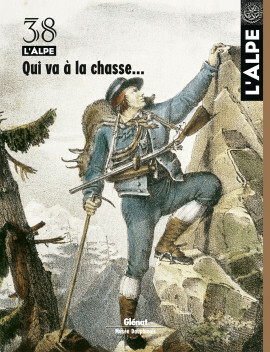 The rich and unusual book, La chasse alpestre in the Dauphiné region, written under the pseudonym Alpinus, is as much a short philosophical treaty on a wide range of subjects as a hunting story. The description and the tracking of wild animals are a pretext for savoury excursions, portraits and many good recipes. For over 20 years, Martine Humbert, 47, has hunted on the slopes of the Ristolas hunting reserve in the Queyras mountains. With no second thoughts, but often alone. Portrait of a huntress on masculine terrain. In the Valais more than elsewhere, hunting is part and parcel of the culture. A traditional bulwark, not disparaged or covered up as a shameful activity, it brings the entire population together and pulls in even opponents… for a good meal of venison. In this mountainous canton, is would appear as natural as cow fighting and the famous raclette dish. He shifts between old recipes and daring inventions. Cooking game stirs the taste buds as well as the memories of Michel Rochedy, who presents here a few secrets drawn from the family treasure trove. Plus, as a preview to his upcoming book (Glénat publishing), a new roe deer recipe with a modern sauce. Head for your kitchen ! For or against ? The debate is on as to whether hunting still serves a purpose today. No, claims the naturalist against those who consider themselves wildlife managers, a position judged simply unacceptable according to scientific criteria. The controversy is far from over. He aims at Alpine wildlife, but his trigger is a button on a camera. The trophies he brings back from his long observations bear superb witness to the mysteries of the wild life, the mating, battles, attitudes and habits of large mammals and the tiniest of birds. The striking photos of Claude Morerod are an enchantment and they plead in favour of preserving an exceptional environment and biodiversity that are constantly under threat. Strike up the music ! Brass bands, local groups and municipal ensembles brought music to the streets during the 1800s. Representing a democratic ideal attempting to reconcile the people with art, this music played a major social and moral role. Though that particular period is over, amateur groups actively continue and today are exploring a wide and varied repertoire. The exposition at the Hector-Berlioz museum (Isère, France) presents the adventure of the former musical groups in the Rhône-Alpes region. Charlotte Perriand, a multi-facetted artist, has never ceased wondering how we humans might best live in a harmonious relationship with our environment. A quest inspired by mountains which play a significant role in her life and work, as is evidenced by the exposition at the Maison des Jeux olympiques in Albertville (Savoie, France).